This compelling book offers plenty to think about regarding animals, food, and the ethical considerations between the two. 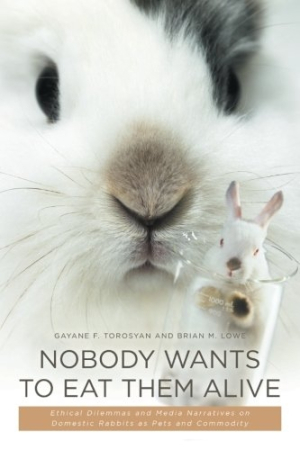 Gayane F. Torosyan and Brian M. Lowe’s Nobody Wants to Eat Them Alive offers an academic look at the way media portrayals of rabbits determine the animal’s status in society. The authors, a communications and media professor and a sociology professor, set out to demonstrate the biases that affect the way rabbits are presented by documenting such portrayals. Arguments around the ethical dilemmas of deciding which animals are pets and which are food are well considered. The book invokes symbolic categories similar to those of Russian symbolist Vladmir Propp to make sense of the lenses through which media consumers might perceive rabbits. These categories include ethical (perceiving rabbits as pets), commodity (perceiving rabbits as a source of goods), medical (as laboratory subjects), environmental (as pests or nuisances), and entertainment (as figures in cultural media). The categories are succinctly conveyed, offering enough detail and context to make distinctions clearly understood. The work also considers a lens of change, asking what could shift perceptions of the categories that rabbits might occupy. The book demonstrates that there are many categories, both symbolic and narrative, into which rabbits are placed by mass media. As an example, it contrasts views of rabbits and horses in order to put categorical distinctions in sharp relief. By considering the horse, an animal with a largely rural context, and the many ways it is perceived as a beast of burden and in some cultures as food, Torosyan effectively demonstrates the ways in which symbolic contexts can shift. Toroysan includes her own personal entry point to the subject: she adopted a rabbit and received a crash course in understanding the proper care of rabbits. These details do double duty in that they explain the author’s potential biases and they also show how she became informed on the subject. This makes the work more personable and accessible to those outside of academia. Arguments continue along narrative lines, drawing on an argument “that ‘food’ animals are kept in inhumane conditions,” whereas more sociable animals are treated with more consideration and better habitats, and should not be killed for things like scientific experimentation. This argument becomes a hopeful conclusion of sorts, suggesting that more humane treatment of animals will lead to a decline in “exploitative practices” like slaughter and lab experiments. Well researched and documented with a thorough bibliography, the authors’ claims are authoritative. A clear introduction stating the goals of the work and its research, in addition to a concise conclusion, keeps the work from getting too buried beneath ideological views. Stylistically, the book is rather dry and abstract. It is difficult to imagine many from beyond academic audiences reaching for the title. Nobody Wants to Eat Them Alive is a compelling book that offers plenty to think about regarding animals, food, and the ethical considerations between the two.